Are you looking for something sweet or salty? Look no further - City Coin Vending Services has an assortment of cookies, candy, pastries, pretzels, soups, crackers and a variety of chip selections. 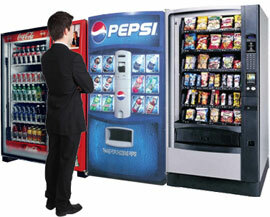 Our snack machines can carry up to 45 different items. We offer name brand products that you can enjoy 24 hours a day 7 days a week. With our almost endless selection of snacks, you can be sure we will stock those items that you and your employees request. Whenever you want to make product changes, no problem, just let us know! If you have any questions or would like to inquire about a free no-obligation consultation, call us today at (403) 253-0324. We would be happy to help you. We carry a large selection of brand name snacks products such as cookies, pastries, soups, bagged candy, pop tarts, nuts, gum and mints. Crunchy, savory, perfection! We look to offer the best variety so you can enjoy both the traditional chip along with the newest and latest product selection for you to enjoy. Have a sweet tooth? City Coin has a wide variety of candy bars that include all of your favorite treats.